In the second half of season three of Star Wars Rebels, we were treated to a vergence in the story that was a long time coming. Sabine Wren has been a wonderfully well-developed character, with a haunting background. Yet, her haunting background had not been fully revealed until the episode Trial of the Darksaber! Below is a marathon of episodes to refresh our minds on the events that led to Wren’s call to action in her heroine's journey. What better place to start than her first introduction to us in this short video. Here we see Sabine infiltrate an Imperial base to cause an artistically explosive distraction! In this episode, Sabine puts her training from the Mandalorian Academy to good use, as she steps in for some improvisational translating. Pay close attention to the compliments from Minister Maketh Tua at the beginning. This episode reveals our first real glimpse of Sabine's past. She left the Empire because they hid information from her. Something Hera appears to be doing to her now. It takes a lot to get either one to trust each other, but trust goes both ways. This is not Sabine focused but comes into play later on. This episode is where Ezra and Kanan go to a Jedi Temple to further their training. Both must face challenges inside themselves. When on a mission together, Ezra and Sabine run into someone from Sabine’s past. Here we learn briefly more about the life Sabine led before joining up, with the Ghost crew. In this episode, the Rebellion is looking, for alternative hyperspace lanes that will be not tracked by the Empire. In their search, we are introduced to Fenn Rau, who is the leader of the Mandalorians on Concord Dawn. Sabine reveals herself to her fellow Mandalorians in bold fashion. Again, this is not Sabine focused but crosses into her path soon. In this episode, Ezra and Kanan return to the Jedi Temple on Lothal, with Ahsoka to discover the best course of action against the Inquisitors. The shadow emerges! In this episode, it is revealed that Maul is still alive, who has a deep connection to Sabine's people on Mandalore. Characters collide as they send the Ghost crew in a drastically new direction. In this episode, Maul holds the Ghost crew hostage until Ezra gives him the Sith Holocron. How cruel Maul’s comments are to Sabine. Much is revealed to Maul’s intentions, but more is to be revealed of his true vision. Sabine and Ezra return to Concord Dawn, with prisoner Fenn Rau. Much sadness ensues as reality comes into focus that the Empire had left their mark. Much is revealed of the current fractured state of Mandalore. Maul returns to further use Ezra in order to complete his mission of revenge. Ezra learns more about the Sith. About Dathomir. Sabine, in the end, obtains the key to the future of Mandalore. And here we are. The fate of Mandalore rests on the shoulders of Sabine. Something she was not prepared to face… The beauty of this episode is how it puts into focus the extent Sabine has gone to save her people and the events that followed. This is only the beginning. 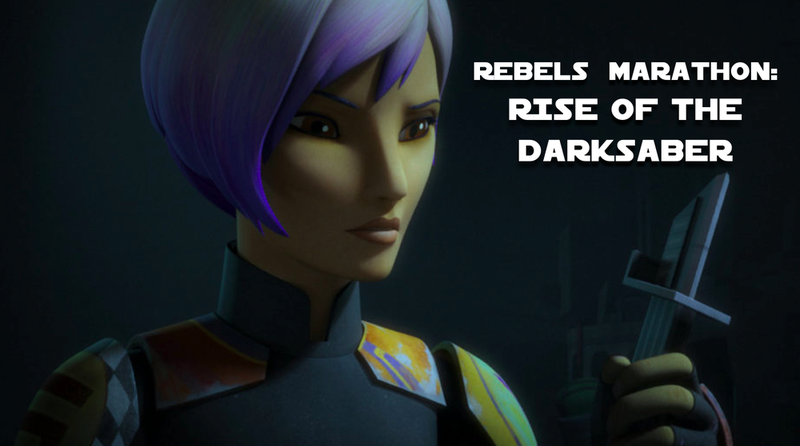 How Sabine rises to the challenges she has yet to face is bound to be epic. It is exciting to see the journey she will go on. I hope you enjoyed rewatching these episodes, and if that is not enough, there are even more to go back to watch! Rebels has done a great job of peeling back the stories to these characters. Comment below your favorite Sabine moments, and thank you for reading!